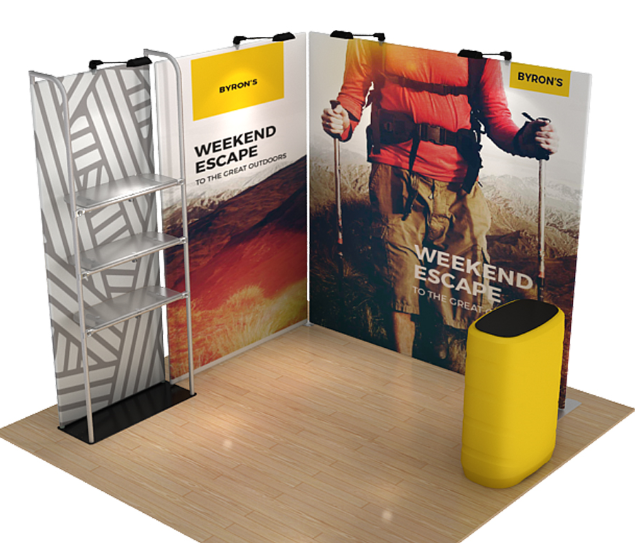 The Wave Tube Display offers two Merchandising display add-on frames, the Waterfall shelf frame Attachment and Merchandising Stand-alone display frame. 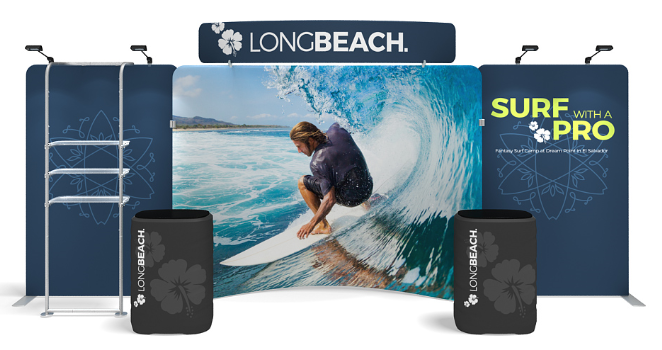 Both Options are compatible with the Waveline Tension fabric backwall display. 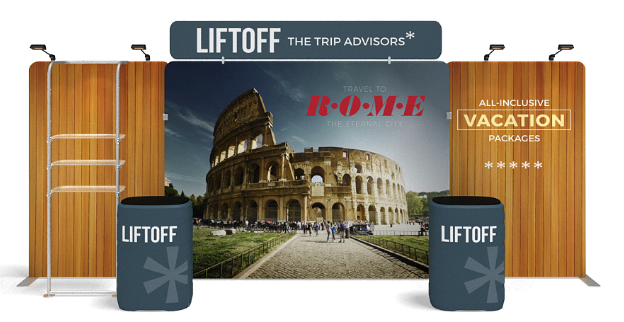 Using this combination, you can create nearly any width display you might require. 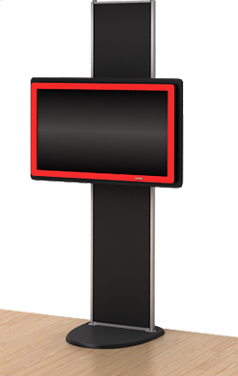 Panels can be front lit or backlit!. 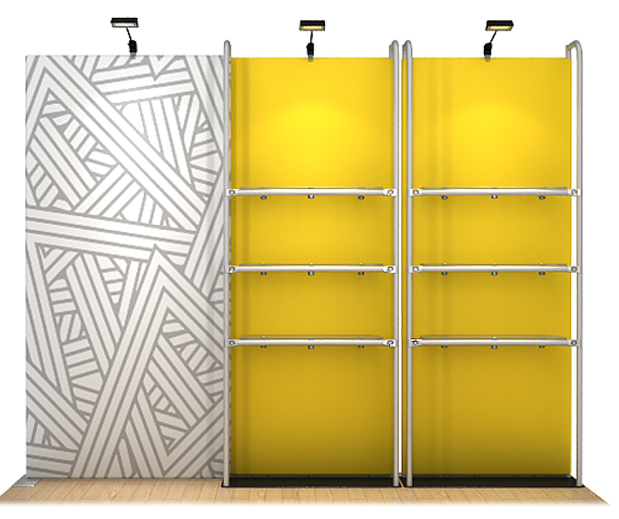 For more central backwall configurations see our Waveline Tension Fabric Display section. 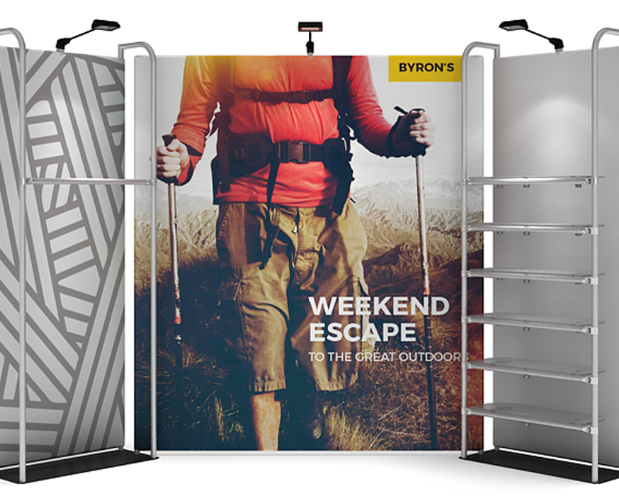 The Waterfall frame attachment is a stand-off shelf that attaches to the Waveline backwall panel to support product shelves and garment rods. 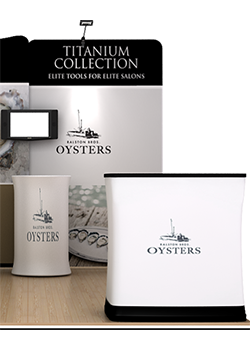 Frames may have fabric graphics above and below shelves or no fabric graphics at all. . 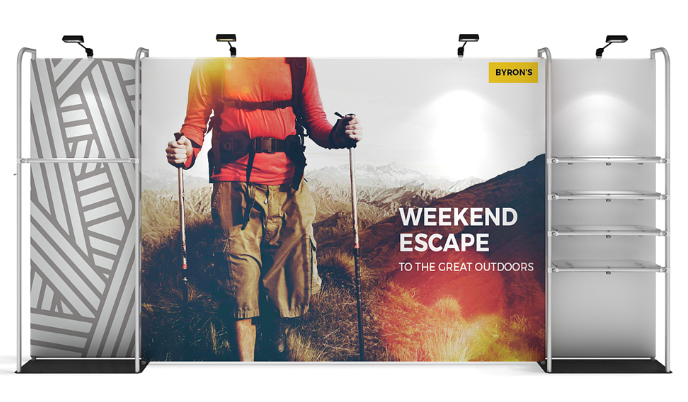 The Waterfall frame is 28” wide X 89” high and requires a Waveline panel for support. 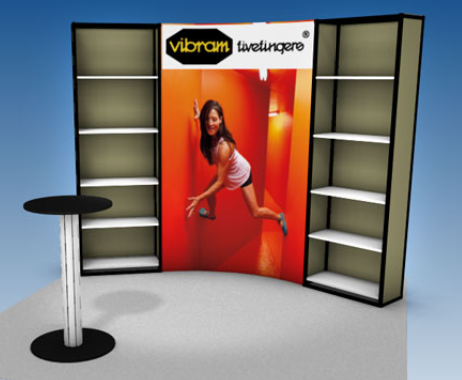 The Wave Waterfall Frame Attachment attaches to a Waveline backwall to form a merchandising shelf display, so it is not free-standing and requires a backwall . 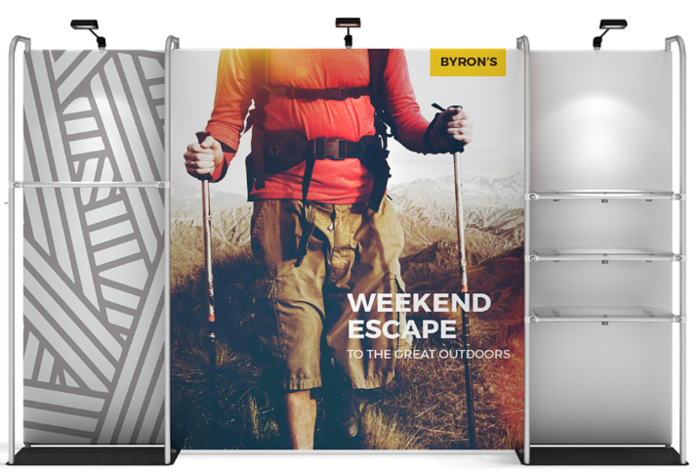 Graphics on both sides of the Waterfall frame are included. 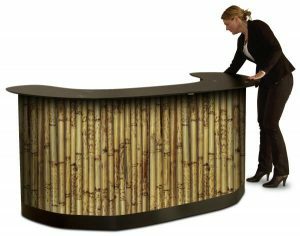 The Waterfall Stand-off is a little lighter, a little smaller (28″Wide X89″H) and more compact than the Merchandiser Rack. 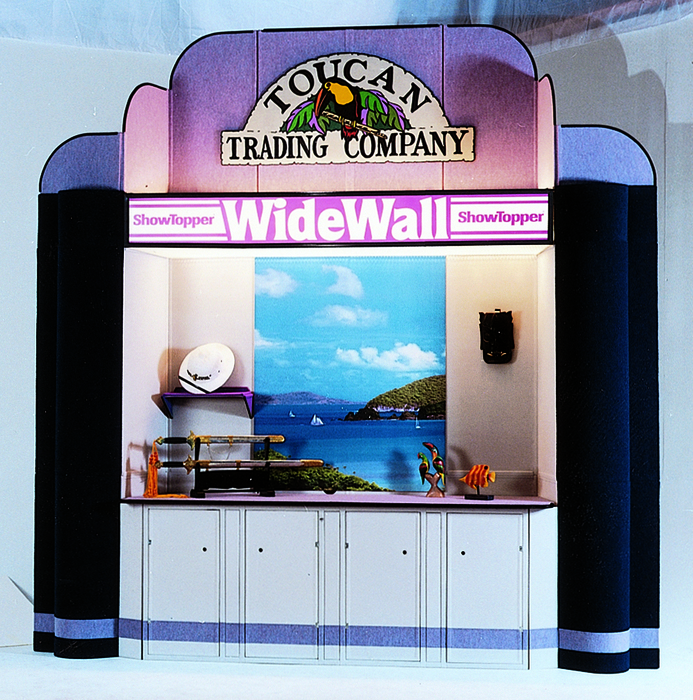 A Waterfall shelf unit is shown above on a 20ft Waveline backwall display with a Waterfall frame attached. 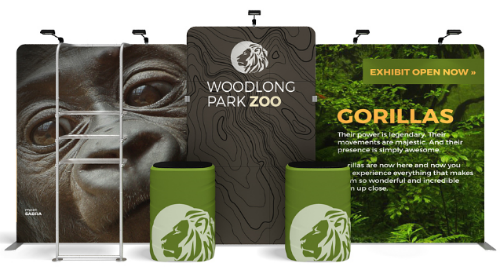 Woodlong Zoo style shown above, basic panels. 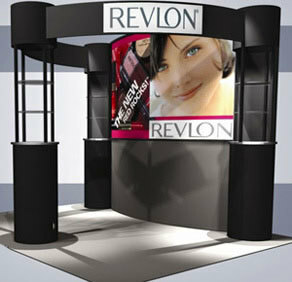 Waterfall frame, shelving and graphics $3,350. 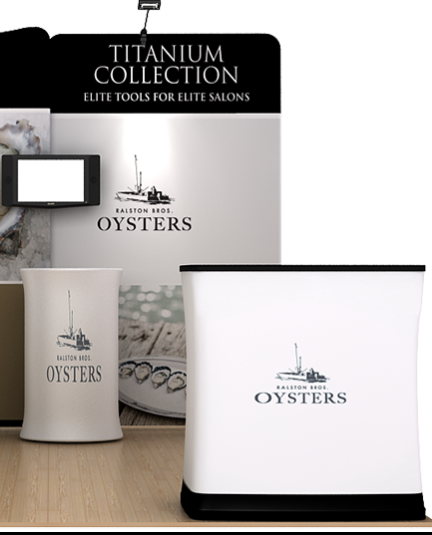 With pedestal cases & lights upgrade: $4,955. 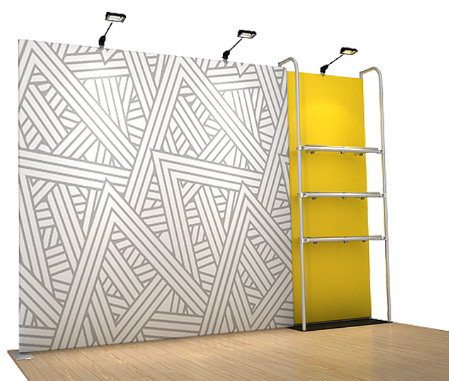 To view all backwall panel designs, go to our Waveline Tension Fabric Displays section. 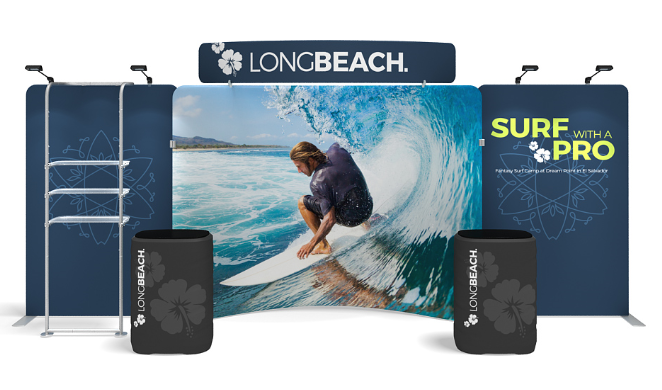 Add graphics to the Waterfall Frame attachment to reinforce your brand or use no graphics to allow view of your backwall graphics. 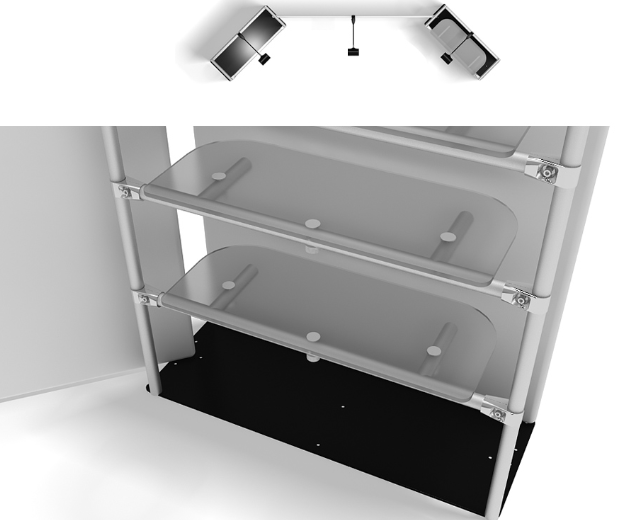 Shown above (L to R) shelves inside frame & no graphic, full graphic with shelves outside, half graphic with shelves outside frame. Limit to 3 shelves recommended. 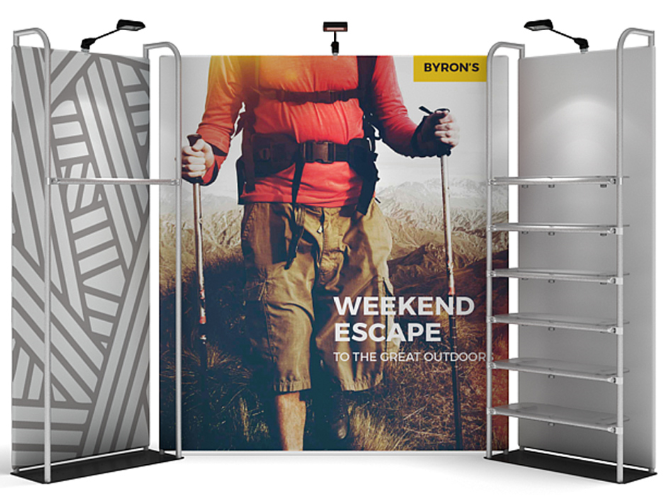 Attach Waterfall to any width Waveline panel to create your custom size display. 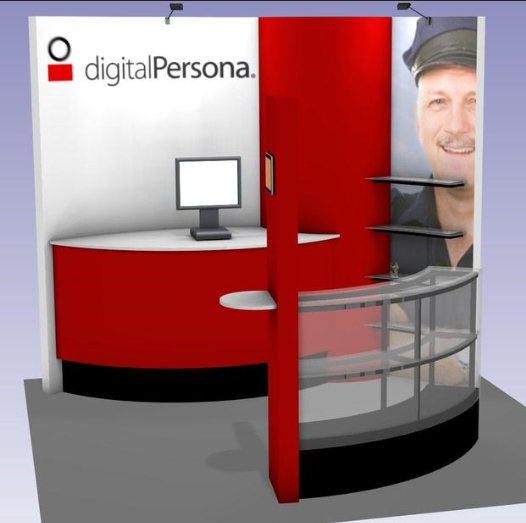 10ft display, 2-panel, 1 Merchandiser rack. 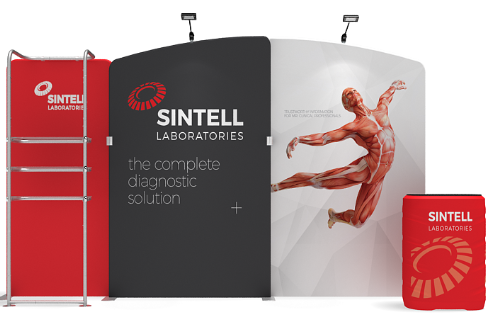 panels, Waterfall, graphics, cases & lights. 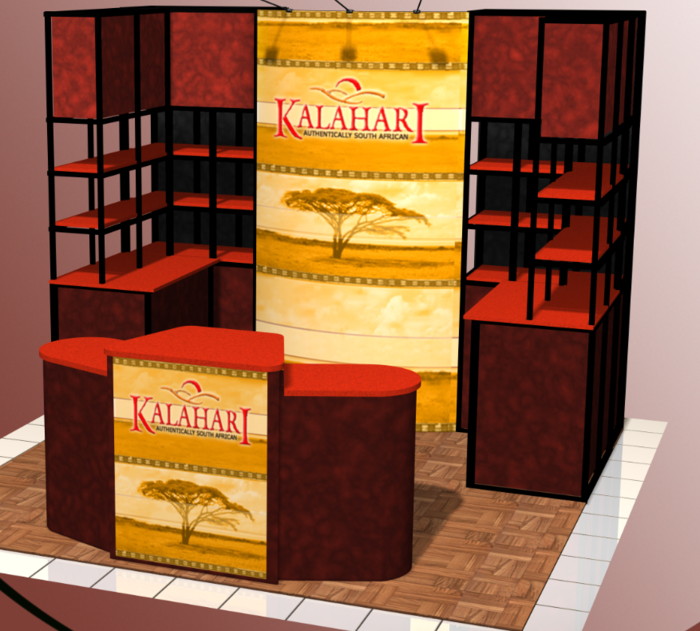 20ft display, 3-panel, 1 Merchandiser rack. 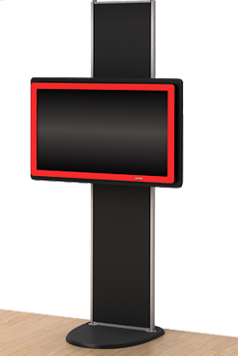 video monitors. 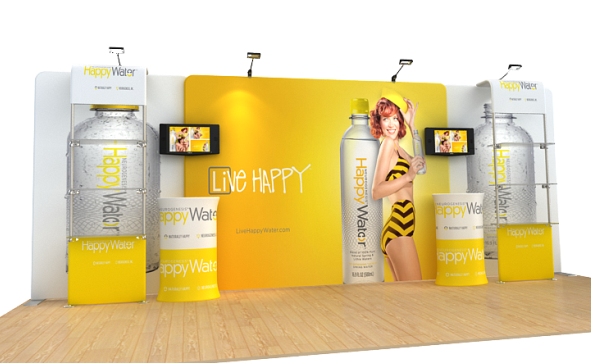 Design: # Happy-Water-20. 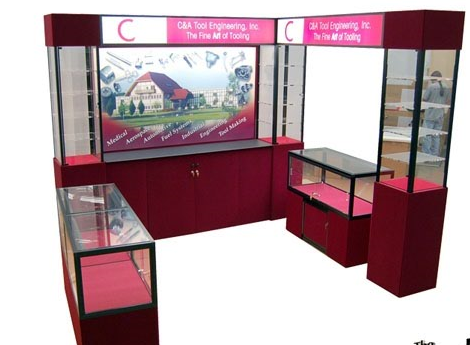 20ft display, 4-panel, 1 Merchandiser rack. 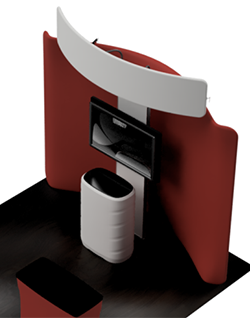 display panel to add dimension and functionality. 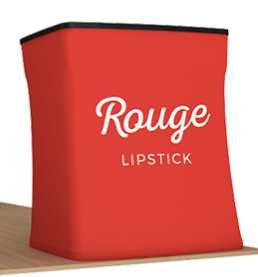 Holds up to 3 shelves. 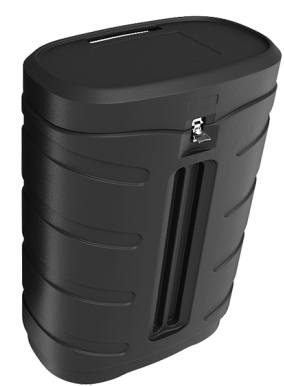 Supports up to 9 lbs per shelf. 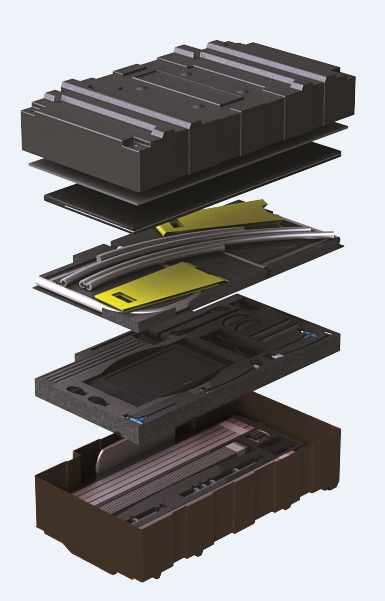 frame cover. Not freestanding; needs back display. 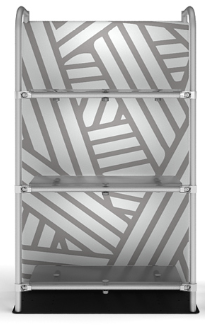 Plexi Shelf, 27.5 w x 12″d: # WFPS: $90 ea. 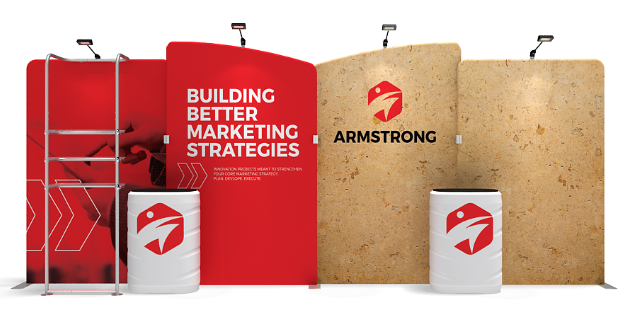 The Central Wall: The Waveline center piece is a tension fabric panel or panels for your graphic message. 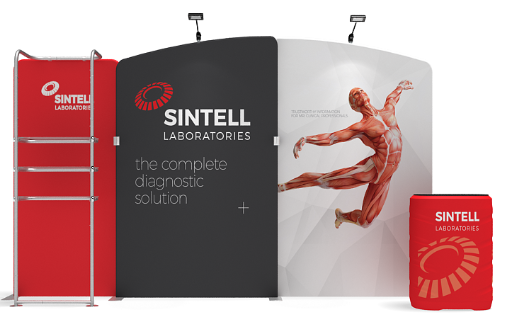 Panels are available in sizes ranging from 41” wide to 116” wide. 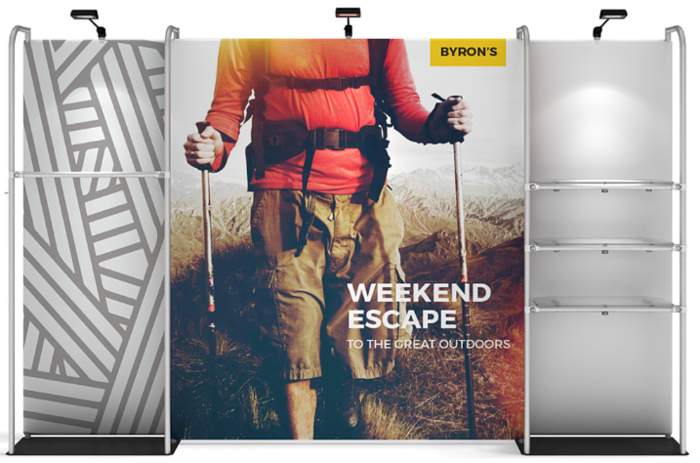 By combining single or multiple panels, nearly any width can be configured. 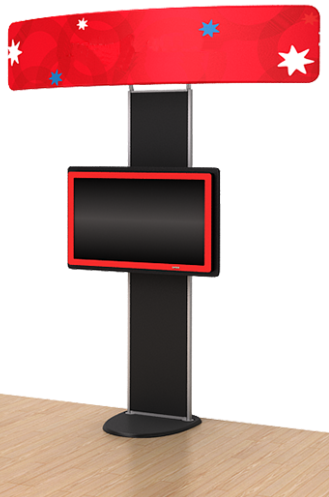 Panel heights are 89”, 96” and 129”. 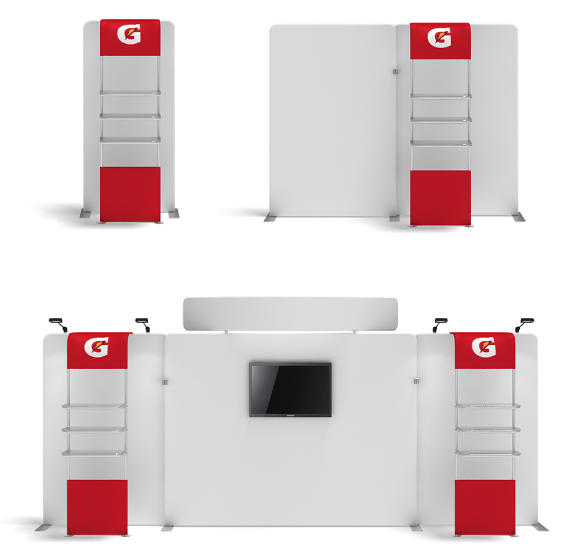 The Merchandiser Product Rack is a free-standing frame and also supports shelves, garment rods, video monitors and floodlights. 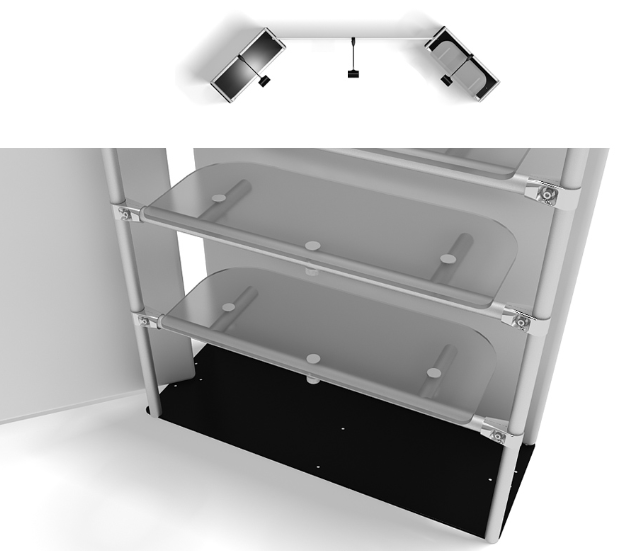 The Merchandise Rack can be connected to the backwall or can stand alone to be located any place in your space. 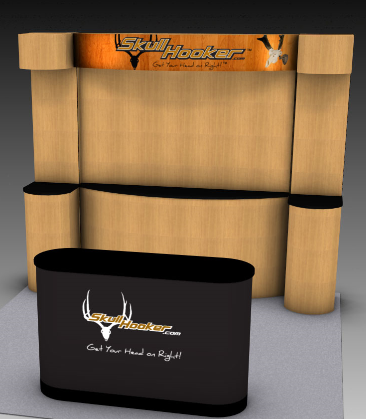 The Merchandise Rack is 37” wide available in heights of 60”, 89” or 116”.. 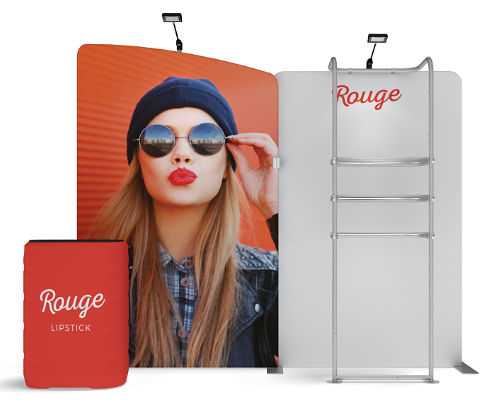 The Wave Merchandiser Product Rack is a stand-alone display frame with tensioned fabric graphics on one side, both sides or no graphics. 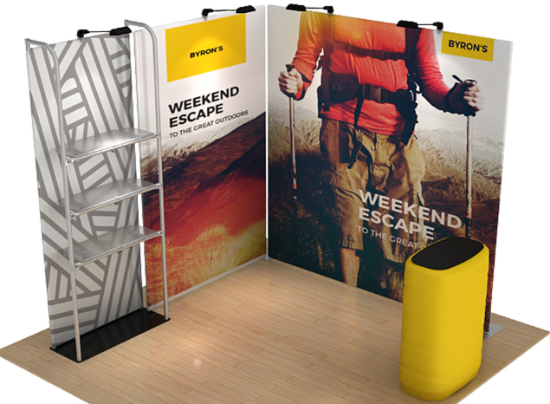 The Merchandiser Stand can be placed side by side with Wave graphic frames, thus becoming part of the backwall, to make a custom width display. 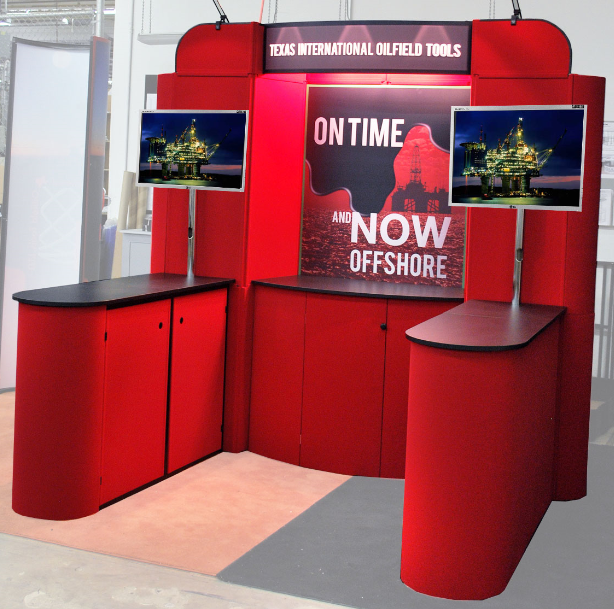 As a free-standing frame it can be placed out front of your backwall for fast access and product demonstration. 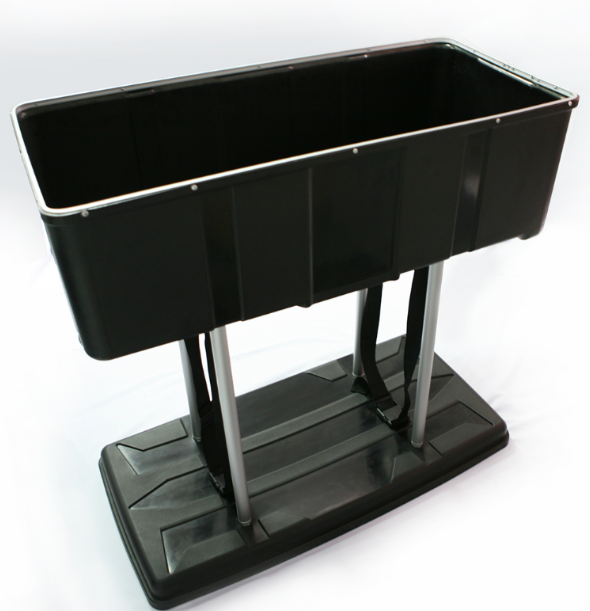 The Merchandiser has a multi-use base plate that can connect the Merchandiser Rack frame with Wave panel frames for a straight or angled configuration. 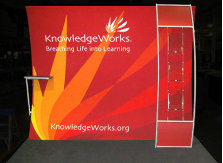 The 20ft 3-rack display shown above with frames, panel graphics, Merchandiser rack: $4,004. 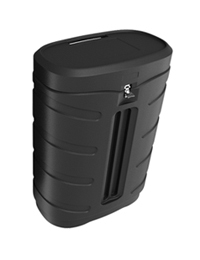 With lights & shipping cases: $5,542. See below for case options. 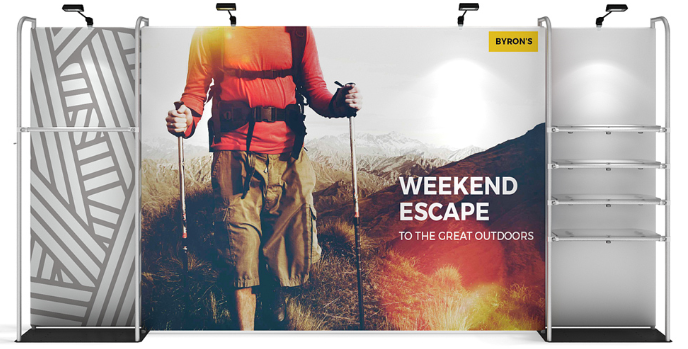 Graphics printed on backside of frame. 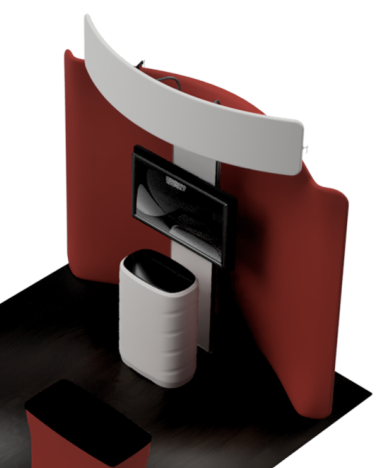 Requires no backwall support. 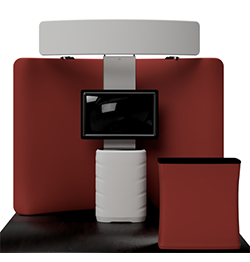 Supports shelves, garment hanger, video monitor, and floodlights. No practical limit to number of shelves. 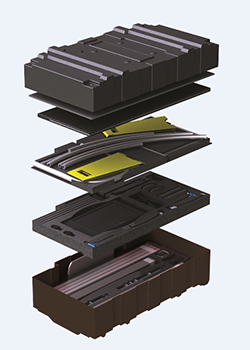 Baseplate of Merchandiser Frame has multiple applications. 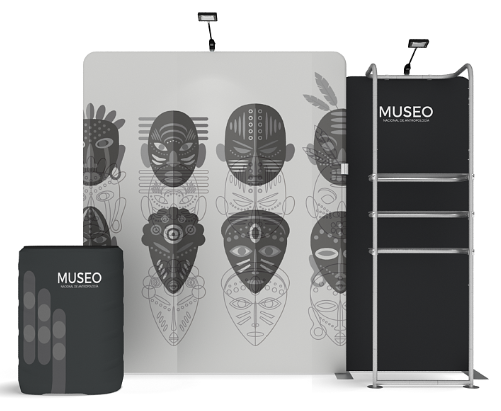 It can connect graphic panels to the Merchandiser at any angle to become a part of the backwall. 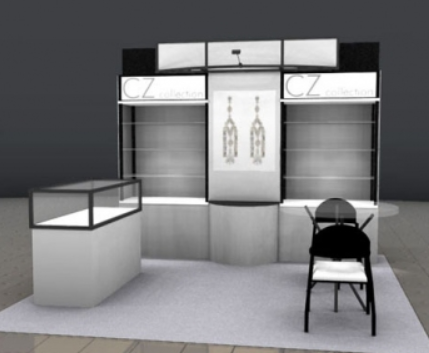 Accessories include Clear or black Plex shelving, Garment hang bars and waterfall hangers. 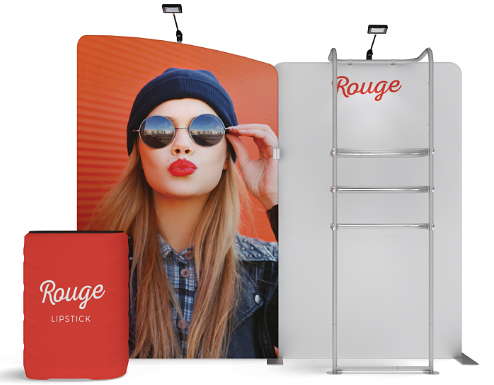 1-panel,2-merch racks 10ft tension display. 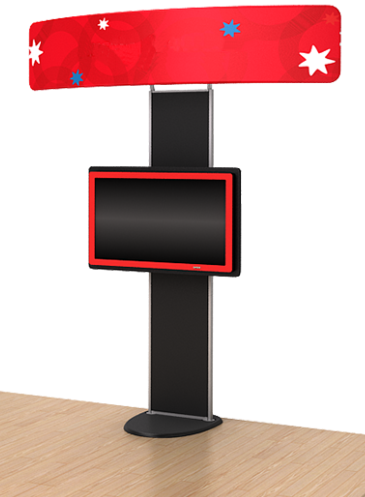 13ft display, 1-panel, 2 Merchandiser racks. 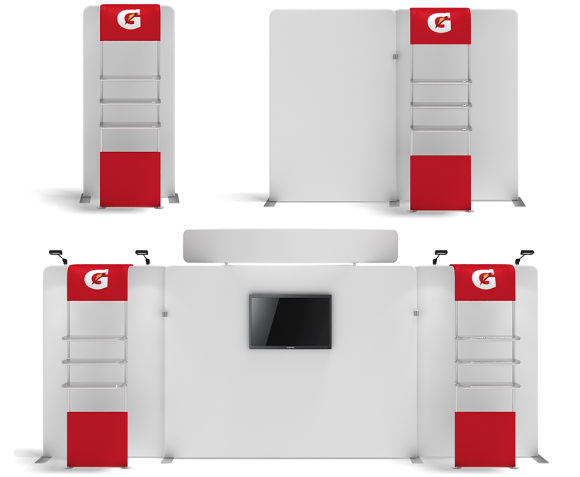 16ft display, 1-panel, 2 Merchandiser racks. 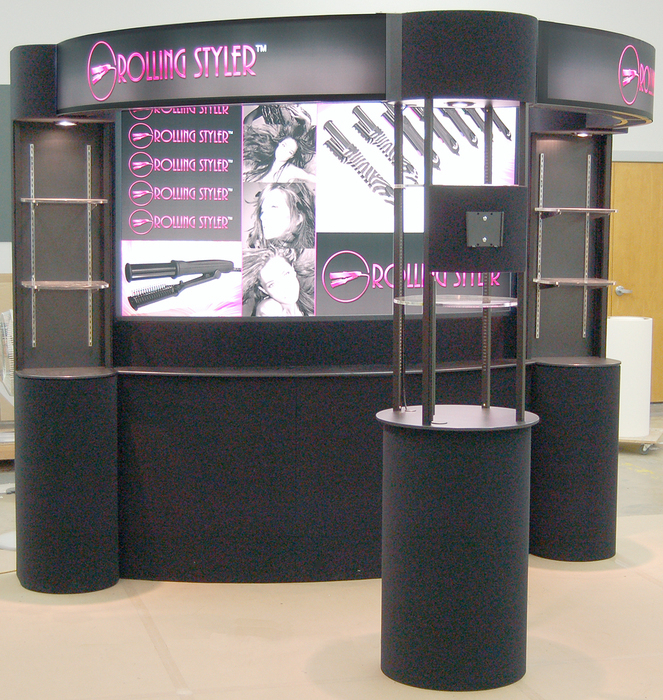 10ft display, 1-panel, 2 Merchandiser racks. 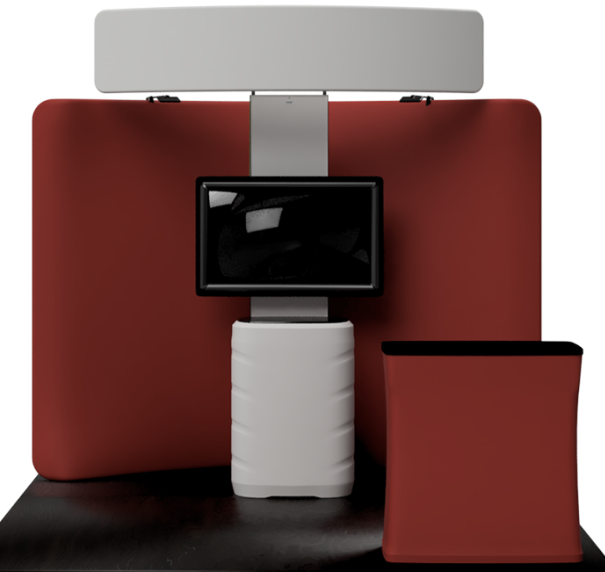 Add shelves, cloths or product hang bar, or IPad stand. or a combination of hang bars and shelves. 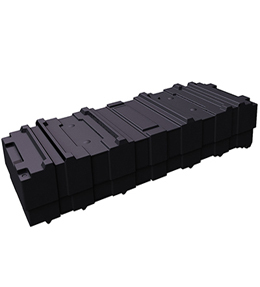 20lbs max per shelf. 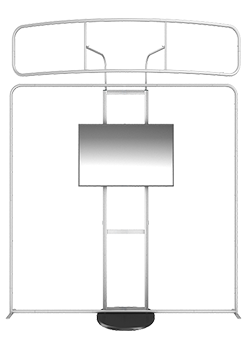 Display Item Clear plexi shelf, Design #: WBWLM-94: $115 ea. 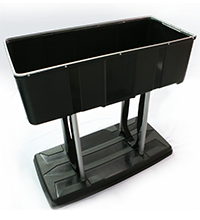 Display Item black plexi shelf, Design #: WBWLM-94: $90 ea. 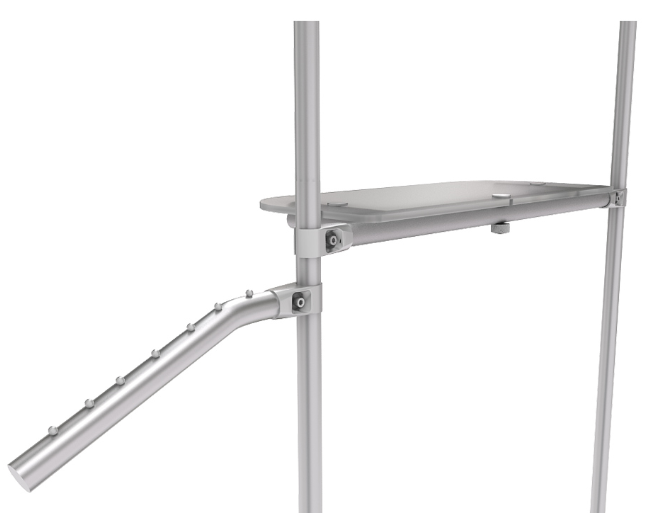 Display Item Hang bar #: WLM-88: $40 ea. 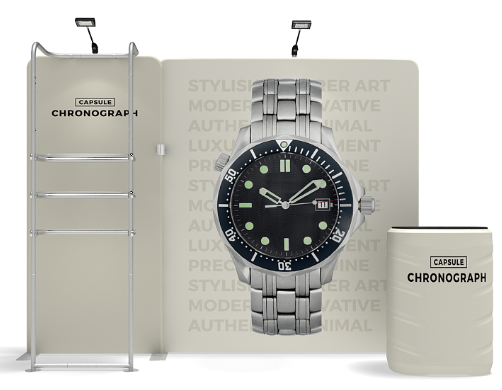 Arm spotlight: Design #: L4000C : $91 ea. 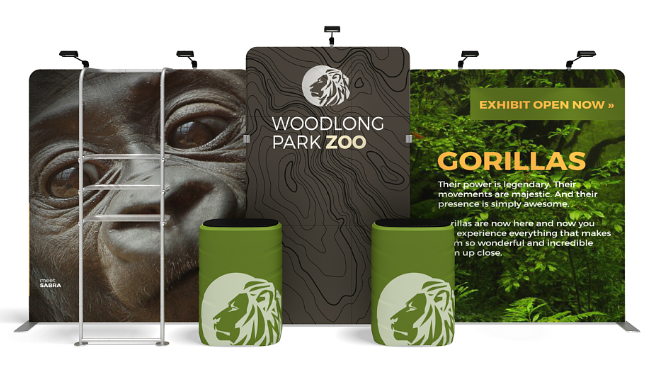 Like most of our display systems and custom displays, Our Waveline System offers backlit panels & displays for product emphasis and greater visual impact. 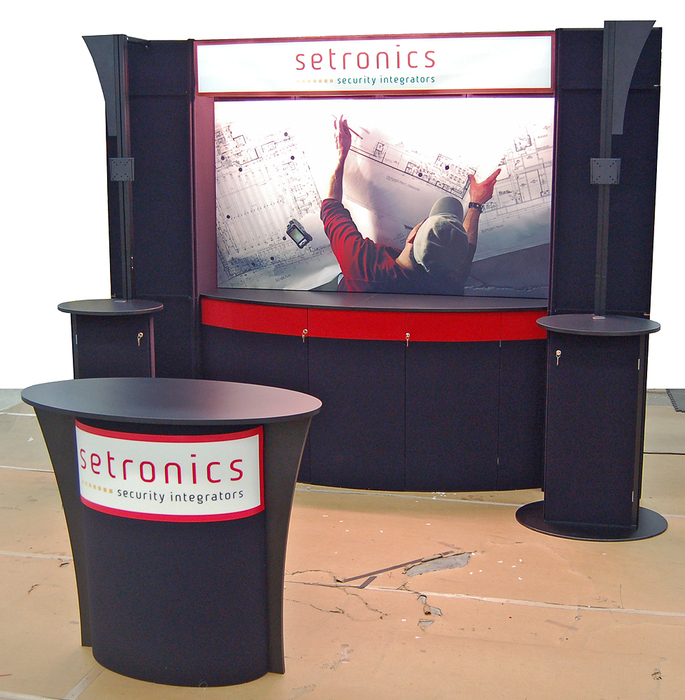 Also, see our Backlit Displays section. 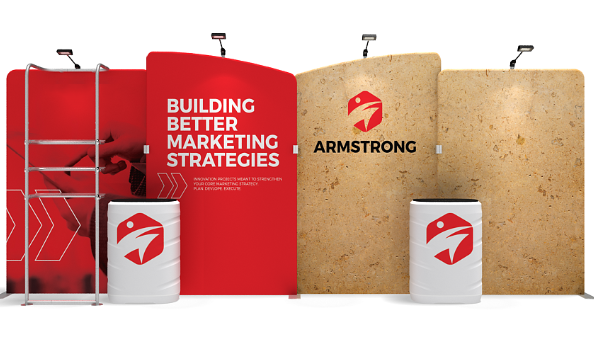 The following images were custom portable designs we produced for clients. 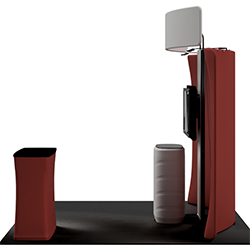 We are presenting them here as Idea Starters for similar designs that may be recreated using the components of our Waveline Display System. 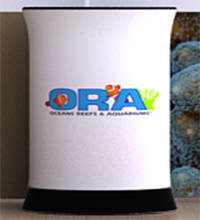 Request a quote for a design that fits your custom needs.